Samsung decided to unify the naming of its Galaxy devices. First it was the Note, then the A series caught up with the flagship S series. 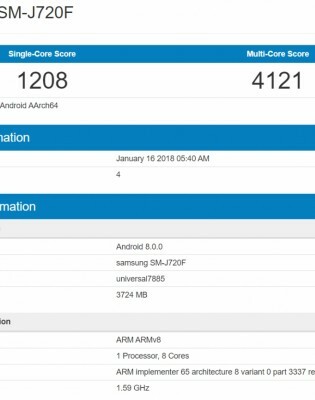 A new device from the affordable J series codenamed SM-J720F appeared on Geekbench and GFXBench and sound logic suggests that a Galaxy J8 (2018) might be announced. The specs chart in both benchmarks show the Exynos 7885 chipset that comes with octa-core CPU, clocked at 1.6 GHz (technically 1.59 GHz). The GPU is Mali G-71 and the RAM is 4 GB. Internal storage of the SM-J720F is 32 GB. The new phone will have a regular 5.5” screen with HD resolution (1280 x 720 pixels). The back camera is listed with 12 MP sensor, while the front one will be 8 MP, both shooting video in Full HD resolution. OS listed is Android 8.0.0 Oreo. 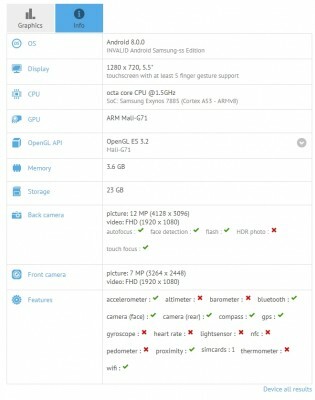 If the alleged Galaxy J8 (2018) comes out before MWC 2018, it might be the first Samsung device with the new OS, overtaking the expected flagship Galaxy S9. These specifications are not true its model number is J720F which mean that it will be from J7 series not form J8 because if it is J8 then its model number should be J810F.